This entry was posted on Wednesday, October 31st, 2012 at 8:31 pm and is filed under Uncategorized. You can follow any responses to this entry through the RSS 2.0 feed. You can leave a response, or trackback from your own site. Maybe if Connecticut did not have a sales tax a state resident would be more inclined to shop at the local store. What a concept!!!! Maybe states should tax their own residents for the services the state residents want, and if that requires a higher sales tax than another state, then the chips will fall where they may. This is really no different than purchasers or manufacturers going over seas to procure product for their purposes. It is difficult to respond to your hypothetical statement as to whether eliminating sales tax in Connecticut would provoke a particular response by consumers. Maybe states should tax their own residents for the services the state residents want. This is exactly what states do today. Unfortunately not all retailers collect the taxes that are due at the time of sale because they are not required to. This situation is distorting the retail marketplace to the detriment of small businesses, communities, and even taxpayers. Congress must intervene. I’m with Ken. A person that walks into a store to buy an item of tangible personal property doesn’t care about sales or use tax. He is a willing taxpayer. On the other hand, a person that does not desire to pay more taxes, or believes he is taxed enough, can shop on the internet or purchase from retailers doing business in states that have no sales tax. The latter simply does not desire to give more money to a government that wastes the taxes it already collects. Two intelligent people simply living and acting on their beliefs. 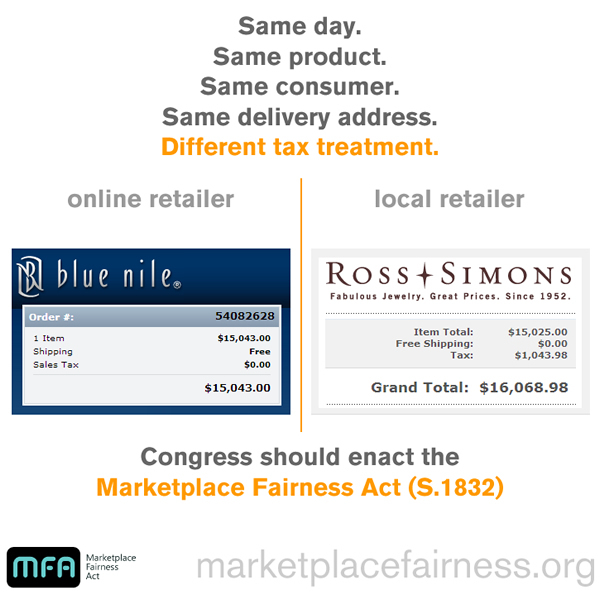 Why does Congress have to level the playing field for brick and mortar retailers while fundamentally shifting and increasing the tax burden to those of us that believe we’re taxed enough already? Your statement describes what is called tax evasion. To be very clear, sales tax is due on all online purchases made by residents in 46 states. If an online retailer elects to not collect the sales tax due at the time of sale, you are supposed to voluntarily report and remit the “use tax” (what sales tax is called when you self-remit). This debate is not about whether sales tax is due, because it is. This debate is only about whether it is still too burdensome for out-of-state retailers to manage sales tax collection at the time of sale. Our view: Technology has advanced considerably since the 1967 Bellas Hess Supreme Court ruling. Congress should recognize this by granting states the right (not obligation) to compel out-of-state retailers to collect their sales tax, provided that state first take steps to simplify and standardize their state and local rules.